The City of Glasgow had no single official armorial bearings until the 19th century. There were at least three official seals in use and a patent was granted by the Lord Lyon in 1866. The first seal on which all the emblems are represented together is that of the Chapter of Glasgow used from 1488-1540, but it was not until 1647 that they appeared in something like their present combination on a seal. 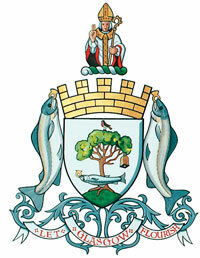 There were several subsequent variations, the latest being in April 1996, when the present Lord Lyon granted a patent to the city following Local Government reorganisation. The bird commemorates the wild robin which St Serf, St Mungo's old master, tamed. It was accidentally killed by some of his disciples who blamed St Mungo. He took the dead bird in his hands and prayed over it, whereupon it was restored to life and flew chirping to its master. The tree is now an oak but it started in the legend as a hazel branch. As a boy in the monastery, Mungo was left in charge of the holy fire in the refectory. He fell asleep and some of the other boys, being envious of him, put out the fire. When he woke and found what had happened, Mungo broke off some frozen branches from a hazel tree and caused them to burst into flames by praying over them. The bell may have been given to St Mungo by the Pope but there is no definite information as to how he obtained it. At any rate, in the 15th Century St Mungo's Bell had become a notable institution in Glasgow. In 1450, John Stewart the first Provost of Glasgow left, as did many others, an endowment to have the bell tolled throughout the city to call the inhabitants to pray for his soul. The City Treasurers' accounts for 1578 show an entry of two shillings "for one tong to Sanct Mungowis Bell" but the ultimate fate of the bell in unknown. A replacement was purchased by the magistrates in 1641 and this bell still exists in the People's Palace. The fish with a ring in its mouth is a salmon and the ring was a present from Hydderch Hael, King of Cadzow, to his Queen Languoreth. The Queen gave the ring to a knight and the King, suspecting an intrigue, took it from him while he slept during a hunting party and threw it into the River Clyde. On returning home, the King demanded the ring and threatened Languoreth with death if she could not produce it. The Queen appealed to the Knight who, of course, could not help and then confessed to St Mungo who sent one of his monks to fish in the river, instructing him to bring back the first fish caught. This was done and St Mungo extracted the ring from its mouth. The scene is represented on the counter seal of Bishop Wyschard, made about 1271. "Let Glasgow Flourish", registered at the Lyon Court in 1866, is a curtailment of the text inscribed on the bell of the Tron Church cast in 1631 - "Lord let Glasgow flourish through the preaching of thy word and praising thy name. The City Arms must not be reproduced without the permission of Glasgow City Council. Born in the early 6 th Century at Culross in Fife, he was the illegitimate son of Urien, Prince of Cumbria and Thenew (later known as Enoch), daughter of the King of Lothian. He trained as a priest at the monastery of St Serf at Culross where he was renamed Mungo, meaning 'dear friend'. Mungo finished his training around 550AD and visited the home of a dying holy man named Fergus, who died on the night that Mungo arrived. Mungo placed his body on a cart yoked to two wild bulls, commanding them to convey it to the place ordained by the Lord. The bulls stopped at a place then known as Cathures where Fergus was buried. Mungo named the spot Glasgui which translates as 'dear green place'; and established a church on the site which is now occupied by Glasgow Cathedral. He was canonised and became the Patron Saint of Glasgow with a feast day on the 13 th January.